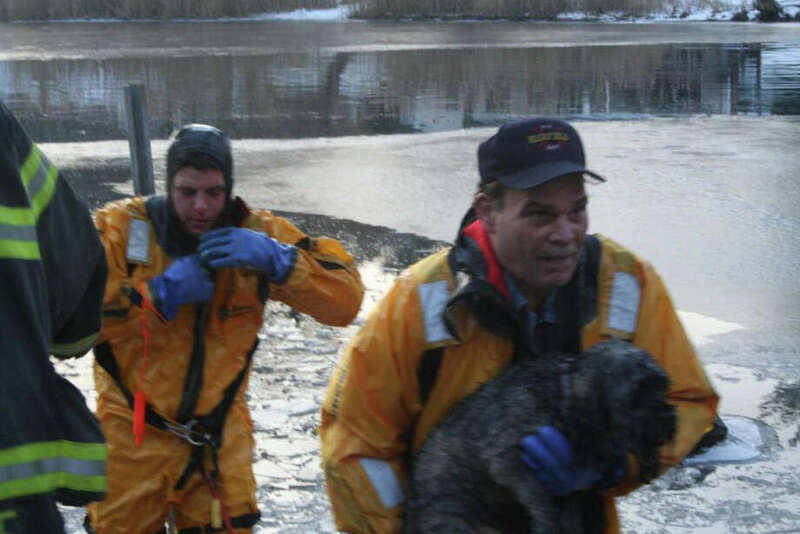 A woman floundering in the icy Mill River as she tried to rescue her dog, which was trapped on the waterway's thin ice, was pulled to safety Friday afternoon by a bystander who tossed her a lifeline and hauled her to shore before firefighters arrived on scene. The dog, one of her two pets briefly trapped on the river's thin- ice coating off Unquowa Road, was carried to safety by firefighters after about five minutes. The woman was treated at the scene for exposure to the cold water as firefighters in special protective gear entered the river and carried the stranded animal to safety. After evaluation by emergency medical technicians from AMR Ambulance, the woman was given a ride to her home. "There was a happy ending for everyone," Fire Chief Richard Felner said in a statement. "It goes to show how practice pays off." Felner said that fire officers had recently trained their personnel in ice-rescue equipment and procedures. "The Fairfield Fire Department wants to remind people that going on the ice are in a very dangerous situation," said Assistant Chief Steven Curry, the incident commander at the scene. "In this case, a bystander was able to call 911 and use a rope to rescue the victim." "It goes to show how the quick response of emergency personnel can make all the difference," said Felner. "It's great to end the year with a call like this, where everyone goes home safely." When the initial report to the town's emergency dispatch center was received, indicating that a woman was in the water trying to rescue her two dogs, the Fire Department deployed Engines 1, 4, Ladder 1 and the Marine 7 inflatable boat. In the wake of the near-tragedy, fire officials remind people of the dangers posed by walking onto iced water surfaces. Whenever a person or animal falls through the ice, officials advice witnesses not to attempt to rescue them by themselves. They say bystanders should immediately call 911 to alert emergency services. Witnesses should also maintain eye contact with the victim and await rescue personnel.